harveysbottomten: Bottom Ten: Catch All the Latest Snores Here! Bottom Ten: Catch All the Latest Snores Here! Arkansas remained atop the Bottom Ten, chalking up its fourth defeat in 22 days. The Razorbacks seem to be working overtime to get into the rankings but, of course, they're feeling pressure to lose. Another once prominent team, Georgia, Tech moved up to No. 5 after a 28-45 loss to Middle Tennessee State. Yes, Middle Tennessee. How badly would the Ramblin' Wreck have done if it had been forced to play the whole state of Tennessee? Ole Mass, obviously fearful of endangering its spot in the BT_and its winless status_gave up 17 straight points late in the fourth quarter to ensure a 34-37 loss to Ohio (Ohio). Elsewhere, Kentucky (1-4) coach Joe (Joker) Philips ought to consider adopting a new nickname. 7. UAB (0-4) ..............42-49, Tulsa...................... SE La. 11. (Tie) Colorado State (1-4) and Colorado (1-4), or vice versa; 13. Rice (1-4); 14. Cal (1-4); 15. FIU (1-4); 16. Florida Atlanta (1-4); 17. Buffalo (1-3); 18. Declined to state; 19. Akron (1-4); 20. Conference USA (the home of four winless teams and four other teams with one win each). Special Citation: Baylor and West Virginia defenses gave up 1,507 yards and 67 first downs between them in WVU's 70-63 win. Quotebook: Orlando Sentinel columnist Mike Bianchi reported that Murray State coach Chris Hatcher, asked if he thought Florida State would finish No. 1 in the Top 25, replied: I'm no procrastinator." Rout of the Weak: Clemson (4-1) over Georgia Tech (2-3) (you can count on our procrastinating). 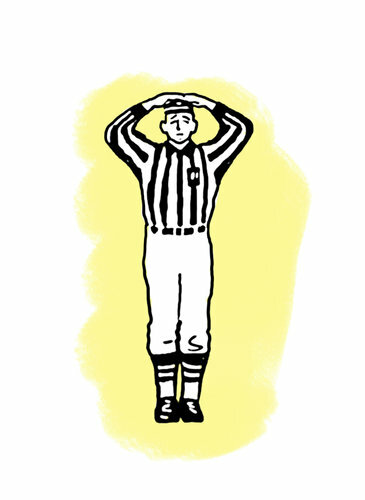 New Orleans QB Drew Brees tied a record for most consecutive games with a touchdown pass. Now he and the Aints (0-4) are out to tie another remarkable record: most consecutive losses in one year (16, held by Detroit). The Associated Press snapped a photo of one disgruntled New Orleans fan's headgear that bore the words: "Aints Throwback Jersey." It was a paper bag. The Lions won't equal their record this year (they've somehow already won a game). But No. 10 Detroit did become the first franchise in 72 years to allow a punt and a kickoff to be run back for touchdowns_in two straight games. Talk about unspecial teams! Meanwhile, the Jets' offense is running on empty though the Wildcat offense was on display in their game against the 49ers. "The problem for the Jets?" wrote the L.A. Times Sam Farmer. "The Wildcat belonged to San Francisco." The Niners' backup QB Colin Kaepernick carried 5 times for 50 yards to spark a 34-0 S.F. win. Gee, wonder if the Jets ever thought of a similar role for their backup QB---what's his name again? 6. Jacksonville (1-3); 7. Miami (Fla.) (1-3); 8. Grampa Bay (1-3); 9. Carolina (1-3); 10. Detroit (1-3). Rout of the Weak: Houston (4-0) over N.J. Jets (2-2). Fantasy League Flops: Jets QB M. Sanchez (13-29, 103 yards, 1 interception, no TDs); Jets RB S. Greene (11 carries, 34 yards, no TDs); Oakland RB D. McFadden (13 carries, 34 yards, no TDs); Tennessee RB C. Johnson (25 carries, 141 yards, whoops, pardon the error---for the first time in a month, Johnson is NOT a Fantasy Flop). Gruden Gibberish: "Romo gets more done on his own than any quarterback in pro football," ESPN's John Gruden gushed before the Cowboys-Bears game. And Tony Romo did do a lot on his own, throwing two interceptions that were returned for touchdowns in the 18-34 Dallas loss. Gruden Gibberish, II: Speaking of the Cowboys, Gruden referred to the "work ethic this franchise is known for." Huh? The franchise is better known for seldom playing up to its potential, having won one playoff game over the last 14 years. The initial error was made by an official who was 20 yards away: "Cardinals quarterback Kevin Kolb's wife gave birth to their third child last week, an 8-pound, 11-ounce boy," wrote Dwight Perry of the Seattle Times. "To no one's surprise, replacement officials initially ruled it a girl." 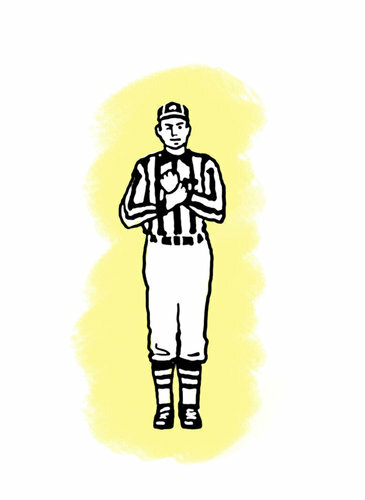 And, finally: One last tribute to two of the more memorable calls by the replacement refs, illustrated by Bob Eckstein of the New York Times. 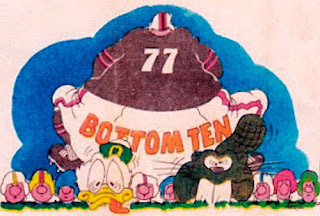 Bottom Ten: It doesn't get any worse than this! The Bottom Ten: This is Spores Center!